He has been taking about 80% of his feeding from the bottle and whatever is left over they just give him in his feeding tube. 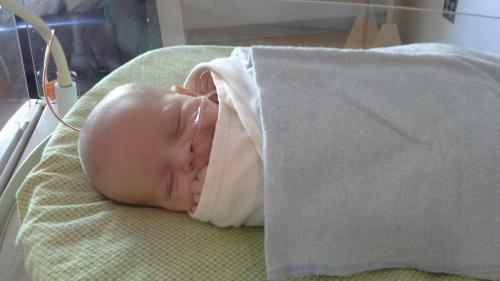 The nurse practitioner said that is great and if he keeps it up he may get his feeding tube out today! Go Hudson! I signed paperwork yesterday to have him circumcised! Gulp. They may have done it yesterday, overnight or will be sometime today. We had mentioned it to his team and they realized since he will be leaving the NICU soon they wanted it done in the NICU before he leaves to just keep an eye on him and it afterwards. We also found out he passed the newborn hearing test. Hooray! During his first few weeks we weren't sure if he could hear at all because the doctors had told us his hearing may be one of the things affected by lack of oxygen. Later we realized he wasn't responding because he was so sedated. We knew once he could track daddy's voice he could hear. Praise the Lord! We are hoping Monday or Tuesday we might be moved to the kidney floor. We heard the room is bigger with our own bathroom in it and there will be far less beeping and crying like there is in the NICU. And of course the girls will be able to come visit! I can't wait! Right now Hudson is taking these daily medicines or supplements orally: something for his hypothyroid, a sodium chloride supplement, an iron supplement, and something for his high blood pressure. (Yep, totally can't remember the names of those drugs. lol) He gets a shot in his thigh every other day of Epo to help him make more red blood cells. He is still a little pale and he is border line in need of another blood transfusion but his levels have been ok to where he doesn't need one, yet. The plan is for the Epo to help him make more blood cells so that transfusion isn't needed. He weighed 7 lbs. 7 oz this weekend and since he lost a couple of ounces they will be changing his formula from Gerber Good Start to Similac Advance to give him a little more protein. He does seem to have heavier wet diapers which is fabulous! Hudson and mommy got lots of snuggle time in this weekend. I am able to pick him up and put him back in bed all by myself now that his picc line is out. He has been enjoying his swing too! Last night Bryan and I were looking back on some old videos we had taken of Hudson shortly after his arrival to Riley. Looking back in those videos made us realize Hudson looked even more bigger and swollen than we originally thought. Maybe it was because we saw him every day?? It broke my heart seeing him so big and it's simply amazing how far he has come. God is SO SO good and we are so thankful that dialysis helped save his life. We were sitting here yesterday morning reflecting on God's goodness, faithfulness, and mercy as well as the blessings from all of our family, friends, neighbors, co-workers , or even people we hardly know. In the midst of this great trial our family is going through, so many of you have prayed for us, wept with us, rejoiced with us and blessed us with meals, gas, or babysitting. We are in awe of the generosity and the time, money, and prayers given to our family. Words of thank you are simply not enough to truly tell you how much ALL of it is appreciated. We just wanted to say thank you from the bottom of our hearts.